Founded in 1994 in an effort to introduce the American market to high-end European coffee makers, Capresso brings excellent versatility and precision for the home barista! Whether you’re looking for a Capresso coffee maker or want to upgrade to a high-end percolator. This Swiss company makes robust coffee machines, grinders, espresso machines, milk frothers and other staples that will help transform any space, even the smallest apartment kitchen, into a bustling, European café. One reason why we love Capresso so much is because it’s owned by Jura, a Swiss company that specializes in home appliances. 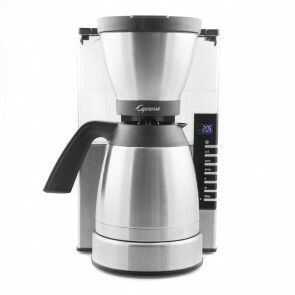 Capresso coffee machines are a great example of innovation in the home brewing realm. The company even makes convenient combo machines, such as the Capresso coffee and tea maker or a coffee maker with a burr grinder built-in. Peruse the different models here to see some amazing features for the home-brewer. We offer a great variety of coffee and espresso machines here at Seattle Coffee Gear, and we know that it can be difficult to find one that perfectly suits your needs. Be sure to browse our selection of Capresso products, featuring expert reviews and opinions from our team. To learn more about the science of coffee head over to our Blog and Coffee 101 pages!